On the surface, it’s a match made in vigilante heaven. The two greatest crimefighters of the 20th century–Batman and The Shadow–have both stricken fear in the hearts of their adversaries for more than 75 years. Both have solved more mysteries than Scotland Yard and the Gotham Police Department combined. But when they initially meet in Batman The Shadow #1, it’s not as bats of a feather, rather as enemies. The two come to blows almost immediately. Mostly because it looks as though The Shadow, who supposedly died of cancer in the 1960s, has returned to Gotham City to kill one of his descendants. Coincidently, the deceased also bears the name Lamont Cranston, just like The Shadow. Batman auteur Scott Snyder teams with Steve Orlando to provide the compelling mystery. Neither is a stranger to the Dark Knight. And their fascination with the character continues. However, this time they are tying Bruce Wayne’s grandfather, Patrick, into some kind of relationship with Cranston. And the writing pair give Shadow fans something to enjoy as well. Batman interrogates Cranston’s known associates–all of whom are well past their crime-fighting prime. Artist Riley Rossmo is a great choice to draw this six-part limited series. Interestingly, he gives Batman a more rooted feeling, while The Shadow is more ethereal. The result is a combination of Jim Lee and Paul Pope pencils, which is a welcome addition to the Caped Crusader’s looks. Batman The Shadow #1, DC Comics and Dynamite, Released April 26, 2017, Written by Scott Snyder and Steve Orlando, Pencils by Riley Rossmo, Colors by Ivan Plascencia, Lettering by Clem Robins; $3.99. There’s a New Batman in Town! It’s our favorite time of the week, and that means we’ve got another installment of New Comic Book Day for you! Here are a few of this week’s new releases that stood out from the crowd. Check out our other blog articles so see our thoughts on other books. Be sure to comment or share our post on Facebook or Twitter if you like our articles! 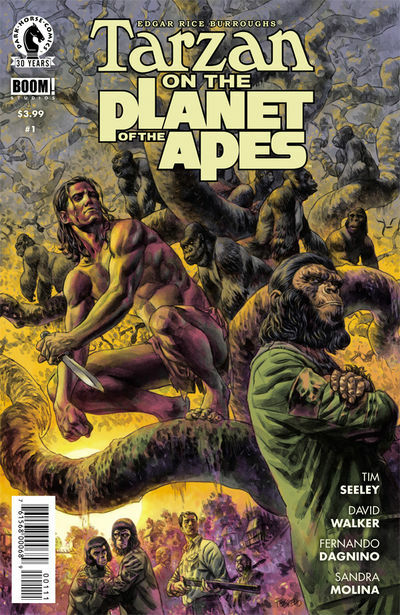 In a change of events from the end of Beneath the Planet of the Apes film, Cornelius and Zira travel back in time to 1901 West Africa instead of 1970’s North America. Here they found a young Tarzan and raised him as their own along with their son, Milo. When the Ape King Kerchak is abducted by hunters, Tarzan and family rush to his rescue, only to place themselves in further danger. Terry McGinnis is back from the dead, and he may not be the only one. Batman Beyond Rebirth #1 gets you up to speed if you’ve never watched the animated television series or read any of the Batman Beyond comics. With a quick recap of Terry’s Batman origin pulled straight from the cartoon, the issue also gives us some insight on what has happened to Terry’s world while he was gone. The main story we get from Batman Beyond Rebirth #1 is that Neo-Gotham’s “Jokerz” gang is up to something much bigger than they have ever done in the past, and Terry needs to figure what that plan is before it’s brought to life. Dan Jurgens does a great job setting up what is sure to be an exciting first arc in the Rebirth of Batman Beyond. 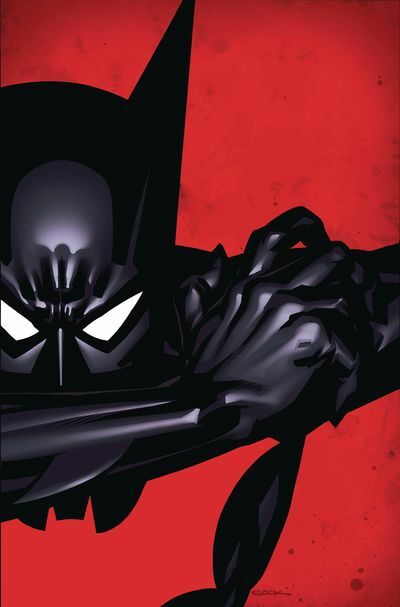 I always loved how the Batman Beyond series took inspiration from past Batman stories. You can see elements from all over Bat-Lore. It’s almost as if history repeats itself. Still dealing with the aftermath of their recent encounter with Apocalypse, the X-Men are all now split dealing with different issues. 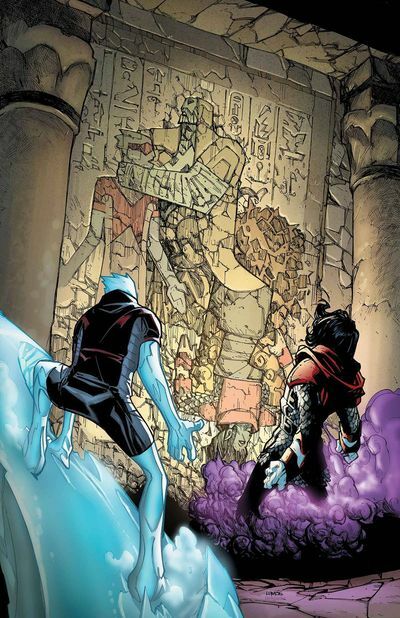 Iceman and Nightcrawler encounter Colossus who’s now transformed by Apocalypse. Forge is left with Apocalypse as he tries to find a way to reverse what happened to Colossus. Storm and Magik look for their missing student, Sapna. Finally, Logan and Jean Grey share some quiet moments being away from their in-danger teammates. Epic. That’s my summation of this issue (and Joshua Williamson’s story thus far). My heart is beating fast. We now know the identity of Godspeed, and it makes things more tragic. After a quick battle against Godspeed in the first four pages of The Flash #7, Barry has to flee the fight so he can recover from a pretty hefty beat-down. Williamson expertly weaves these elements together in this issue — he’s crafting a story that is tense and exciting. This story matters; it has emotional weight that you can feel. I’m especially intrigued by how I identify with Godspeed, whose intentions are actually kind of pure. It comes down to how this person is willing to compromise to get to those ends that makes them a villain. The first crossover of the Rebirth era has arrived! Night of The Monster Men kicks off in Batman #7. A hurricane is on target to destroy Gotham. Batman calls on Batwoman, Nightwing, Spoiler, Orphan, and Clayface to help him avert disaster and ensure that no Gothamites fall victim to the approaching storm. The forces of nature aren’t the only adversaries the Bat family will find themselves up against. As the storm grows near, Doctor Hugo Strange is ready to unleash his army of daikaju on the citizens of Gotham. Since Tom King took over the flagship Batman series in Rebirth, we’ve been seeing a lot more of Batman’s leadership abilities, mentoring and guiding his team. This welcome theme continues into Batman #7, even though King has taken a back seat to Steve Orlando in this installment. Having Orlando write all of the Monster Men crossover scripts while consulting with the regular writers of the individual titles should lend a nice level of continuity to the crossover itself, but the writing here is noticeably different than King’s solo efforts in the series thus far. Riley Rossmo’s artwork has a gritty, throwback quality to it. I probably could have gone my entire life without seeing Hugo Strange’s hairy backside, but the Monster Men themselves are exactly what they should be, monstrous abominations. Colorist Ivan Plascencia brings a muted palette offset by flashes of bright color that sets the table brilliantly for the oncoming storm(s). This first chapter of Night of the Monster Men nicely sets up the second installment, found in Nightwing #5, also released September 21, 2016. Part three can be found in Detective Comics #941, releasing September 28, 2016. Parts four through six will conclude the storyline in Batman #8, Nightwing #6, and Detective Comics #942, all releasing next month. Batman #7, DC Comics, released September 21, 2016, Rated T, plot by Steve Orlando and Tom King, script by Steve Orlando, pencils and inks by Riley Rossmo, colors by Ivan Plascencia, letters by Deron Bennett, cover by Yanick Paquette and Nathan Fairbairn, variant cover by Tim Sale.